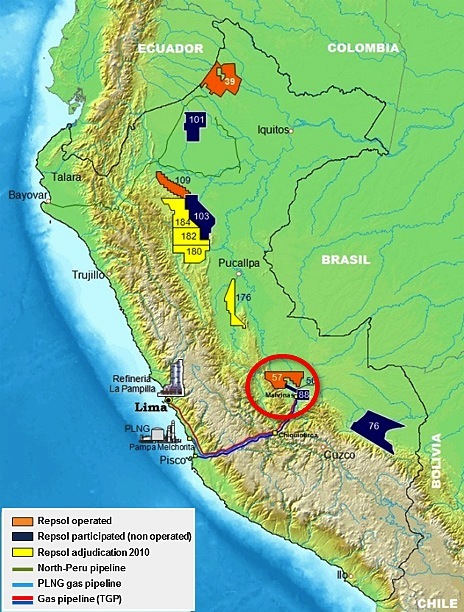 Repsol has made an important gas discovery with its Sagari-1 wildcat in its sub-Andean Block 57 in Peru, establishing gas pay in both the Nia Superior and Nia Inferior formations. Source: Repsol The new gas discovery is close to the Kinteroni field, due to come on stream by the end of the year. Source: Repsol Production tests carried out at depths of between 2,691m and 2,813m produced gas flows of 26 MMcfgpd with 1,200 bcpd in one formation, and 24 MMcfgpd with 800 bcpd in the other. Repsol plans to carry out further exploration in the block once the production tests are complete. Preliminary estimates indicate the field may hold between 1 and 2 Tcf of gas resources. The Sagari find reinforces the potential of this area in Peru, home to the company’s Kinteroni find, ranked as one of the five biggest discoveries made worldwide in 2008. This field is currently under accelerated development with first gas planned for the end of 2012. It is expected to produce 155 MMcf of natural gas daily in its initial phase. Repsol is the operator of the block with a 53.84% stake. Petrobras holds the remaining 46.16%. Repsol has been stepping up exploration activities as part of its strategic plan in the years to 2016 that it outlined in May this year. Breakeven prices are similar, but tight oil has the largest growth potential.